Solo is a software talkshow system, using your PC, a soundcard and the latest SIP (Voice over IP) technology to deliver a radical new way of routing calls to air without any dedicated hardware. This powerful software transforms your studio PC into a unique call routing system. The software SIP hybrid turns your soundcard into an advanced dual hybrid, with EQ, dynamics, record, playback and editing all integrated. As you would expect from Broadcast Bionics, the software is feature rich, easy to use, yet powerful and robust. Solo has been specifically designed with the smaller studio in mind. It is quick and easy to install and maintain; yet is a powerful and feature rich all-in-one solution. Solo handles multiple SIP, ISDN or Analogue lines. Using additional Buddy licences you can add more workstations to collaborate, produce or call screen. With no expensive hardware or cabling, Solo is quick and easy to install and maintain. Two versions are available - up to 6 or up to 12 lines for a single studio, with the option of adding on up to two further positions (Buddies) for a second studio and producer/ screeners. A Buddy's soundcard can act as additional software hybrids if required. You need very little to get started. Firstly you need some SIP telephone lines. 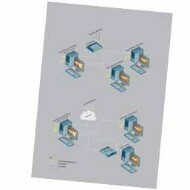 These can come directly from your existing office switch if it can supply SIP extensions, alternatively a conversion gateway can be purchased to convert your existing analogue or ISDN lines to SIP. Secondly, you need a soundcard. (Ask for recommended brands). Thirdly you need a SIP handset (Ask for recommended brands.) Lastly, your PC. 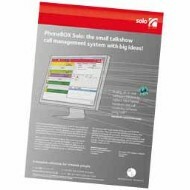 Solo connects directly to SIP lines, but also supports regular phone lines, Mobile(GSM) and ISDN using a SIP gateway. Buddies allow additional workstation to connect in to Solo and collaborate for call screening or producer control.